These words spoken by Sangjenim in 1909 proclaimed the future advent of the Dojeon (“The Holy Scriptures of Dao”) which would convey Sangjenim’s and Taemonim’s teachings to the world. 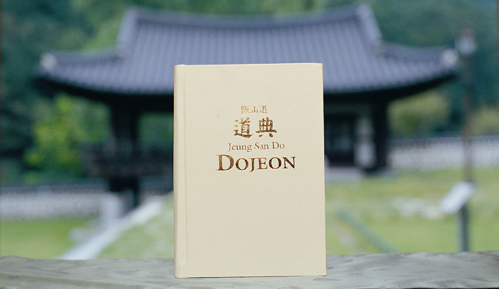 The original Dojeon was published in Korean on October 25, 1992, for the 122nd commemoration of Sangjenim’s incarnation, and it entailed twenty years of extensive research and fieldwork by Jeung San Do practitioners who compiled the written and oral testimonies of Sangjenim’s and Taemonim’s disciples, the disciples’ descendants, and the disciples’ followers. The publication of the 2003 Korean revised edition took an additional eleven years of effort involving further research and extensive review of old and new testimonials to verify and discover dates, sites, events, and people related to Sangjenim’s and Taemonim’s works of renewing heaven and earth. Thus, the Dojeon represents thirty years of dedication by many people. The vital and universal truths contained within this sacred book of dao are destined for all humankind, so Jeung San Do subsequently translated the Dojeon into English, Japanese, Chinese, German, French, Spanish,and Russian.